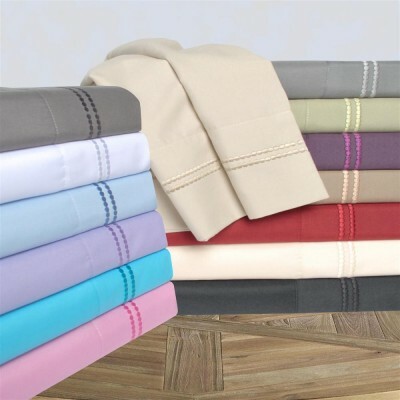 Drift off to sleep with these embroidered full size wrinkle resistant sheets from Impressions. Each sheet set comes in a wonderful decorative gift box that will make you or anyone in your life happy. Drift off to sleep with these embroidered wrinkle resistant sheets from Impressions. Each sheet set comes in a wonderful decorative gift box that will make you or anyone in your life happy. Our 3000 Series Sheets are available in 14 Colors in Twin, Full, Queen, King, and California King. Each set includes a fitted sheet, flat sheet with matching pillowcases (one with twin set). Fully elasticated fitted sheet fits up to 18"
Fitted sheet pocket depth: 15" inches fits up to 18"
Care instructions: Machine washable. Please follow the care instructions on the label carefully to minimize wrinkling and/or shrinkage. Remove bedding from the dryer promptly, press with a warm iron if necessary.